Boca Raton, FL – Southeast Florida Honor Flight’s fourth and final flight of the 2018 season will be a historic one, honoring veterans from three different wars, with the long-awaited addition of Vietnam War veterans. As numbers of WWII and Korean War veterans wane and are being located, the next veterans in line, the Vietnam War veterans, will also be honored for the first time on the one-day trip to Washington, DC with the Stuart-based organization. As of today’s writing, there are 82 total veterans scheduled to be honored on the October 13th Honor Flight—14 from WWII, 41 from the Korean War and 27 from the Vietnam War. The day that many veterans say is one of the best days of their lives begins early with a 4:30AM check-in of veterans, their guardians and Honor Flight staff at Palm Beach International Airport. The chartered American Airlines Airbus 321 flies into DCA where the group will board four police-escorted motor coaches. The day’s agenda includes visits to the Air Force Memorial, Arlington National Cemetery for the Changing of the Guard Ceremony, the World War II Memorial, the Korean War Memorial and the Vietnam War Memorial. Every Honor Flight is designed to fly local veterans to Washington, DC to visit and reflect at the memorials built to honor their service and sacrifices. The October 13th trip is made up of veterans who served in these military branches: Army (40), Navy (19), Air Force (19) and Marine Corps (4). Just a few of the wartime positions represented are A-4 pilot, infantryman, medical laboratory technician, company clerk, truck driver, aviation mechanic, air police, intelligence operations specialist, B-36 electrician, deckhand, radio operator, radar repairman, F-4 air crew chief, presidential honor guard, air traffic controller, boatswain’s mate, navigator and motor pool mechanic. Veterans on this trip served wherever ordered, whether that was stateside or in combat in battles around the globe, including: Battle of Iwo Jima (there are two veterans who fought in this battle on this flight), the Cambodian Invasion, battles around Haiphong and Khesangh, north and south China Seas, and battles in the “jungle”, South Vietnam. Another special “first” for the historic Honor Flight includes a grand welcome home with the performance of The King’s Regiment Marching Band from The King’s Academy from West Palm Beach, FL. 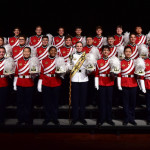 The 32-student marching band will greet the 82 veterans at the traditional Honor Flight “Operation Homecoming” in full red, white and blue regalia trumpeting their appreciation for the veterans’ service with their gift of music. As with every Honor Flight, the public is invited and encouraged to come show their gratitude by welcoming the veterans home from Washington at Palm Beach International Airport the evening of Saturday, October 13th. Operation Homecoming takes place on Level 2, Concourse A/B. The Honor Flight is scheduled to arrive at 7:20PM from DCA. Early arrival is suggested. Please come be part of a heart-warming evening. Bring family and friends, flags, “Welcome Home” signs and cheers. Shake hands with these heroes. This festive welcome home tops off a day that most veterans say ranks with the day they were married and the birth of their children. The King’s Academy Drum Major Lauren Arrington states, “It is a distinct privilege to welcome home these veterans. As students, we enjoy the result of the multitude of sacrifices by the men and women who fought for our freedom.” And as citizens, we do, too. For more information on Operation Homecoming, please call 1-855-FLYAVET (855-359-2838). Southeast Florida Honor Flight needs the public’s help to find local WWII, Korean War and Vietnam War veterans who have not yet taken an Honor Flight. Without a federal veteran database, the organization relies on word of mouth, public education via presentations and civic and veteran groups to find these veterans to sign up for their Honor Flight. If you are, or if you know of a WWII, Korean War or Vietnam War veteran who would like to take their Honor Flight (and has not already done so), please either call 1-855-FLYAVET (855-359-2838) or fill out the veteran application online at www.honorflightsefl.org. It is the goal of Southeast Florida Honor Flight to transition veterans of wars by the sequence of the conflicts. Accordingly, WWII veterans will continue to have top priority, with Korean War veterans next, followed by Vietnam War veterans as flights are scheduled. Terminally ill veterans from any era are also always top priority. 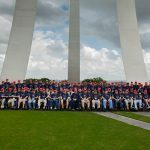 Honor Flight also needs those who wish to give back as guardians—trip escorts for the veterans–for the four flights per year. For those interested, please visit www.honorflightsefl.org and complete the online guardian application. It is an extremely meaningful day for both guardian and veteran. 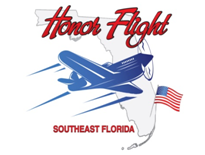 The next scheduled Honor Flights for Southeast Florida Honor Flight are April 13 and May 11, 2019.